Peace is Restored to Ocean Beach! On Memorial Day weekend, 2006, a small group of long-time locals – calling themselves “Peace Rockers” – installed a stunning stained-glass Peace Sign atop the magnificent rock off the shores of Sunset Cliffs. No political statement was ever intended by the design. Rather, the Peace Rockers hoped the Sign would inspire a continual contemplation on tolerance, on harmony, and on the desire of all people for an end to violence. Regrettably, the sign was removed by persons unknown in the middle of the night in about January of 2008, and was never returned. We have it on good authority the Peace Rockers have returned to Ocean Beach. In fact we have proof! very cool. wow, it’s been a whole year since the original peace sign was taken. OMG! Now THAT inspires me to take that nice long walk I have been promising myself I would! Thx Patty! Welcome to the beautiful new peace sign that reminds us that it’s not enough to believe in peace, we must work at it. Sweeet. I was bummed when they took the first one down. This is great, I really miss the old one! 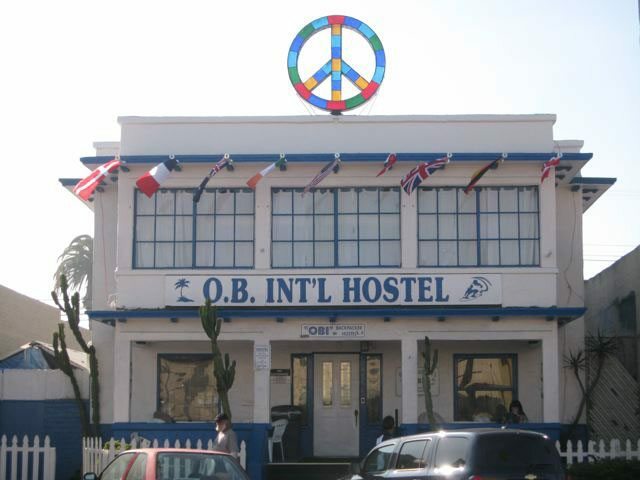 Would it be possible to alter the O’s in OB HOSTEL to look like the peace sign? paint to match the sign Might be a good look. I also have beautiful 11x14s of the photo used on the home page of this site ..the peace sign at sunset….I am glad to share them. Newer Article: It’s Senator Al Franken – It’s NOT Saturday Night Live !